Do you like Japanese school life anime? 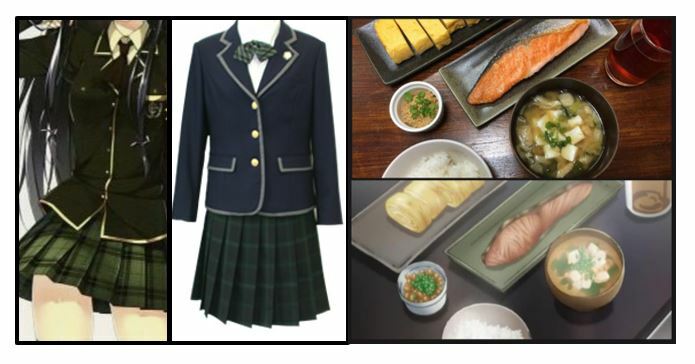 When you see some Japanese cultures like Japanese school uniforms, Japanese school lunch, Japanese school clubs in anime, you would wonder if there is any difference between school life in anime and in real life. In this article, I, a Japanese person who has studied in Japan for 16 years, will tell you Japanese school facts with Japanese sensibilities. You’ll see the social structure in Japan, like the academic background-oriented society and Japanese job-hunting system as well as the real school life that anime never tells you. The school systems in foreign countries vary by region. Some elementary schools have four grades, but others have five grades. Middle schools usually have four grades, but when it comes to high schools, some have four grades, but others have three grades. In Japan, however, every elementary school has six grades with students aged between 6 to 11, every junior high school has three grades with students aged between 12-14, and every high school has three grades with students aged between 15-17. After graduating from high school, most of us go to college and learn there for four years. Therefore, we don’t use grades like your country. We call fourth grade by the fourth grade of elementary school, and eighth grade by the second grade of junior high school. Japanese school starts in April now, but we used to start school in September like the West countries. About 100 years ago, the Japanese government changed the date to April because of national policy. However, some Japanese say that the system makes it difficult for students to study abroad because most universities in the West countries begin in September. Therefore, Tokyo University which is the most advanced university in Japan suggested September admission. They accept students in April and September now because it was hard for all students to start college in September. National exams and employment exams are held in April. If students get into college in September, they have to take another gap year after they graduated from college. It’s actually hard that universities change the start month because we need to change the social structure first. By the way, there are lots of things to do for us before children start elementary schools. 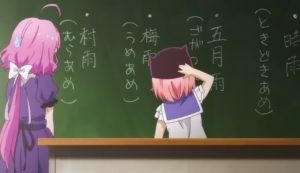 First of all, we have to buy a schoolbag called “Randoseru” (ランドセル, らんどせる). It symbolizes elementary school students in Japan. We use it only at elementary school, but most of us are excited to get it. And then, we need to buy the things below: a pencil case, pencils, an eraser, color pencils, crayons, scissors, glue, a writing mat, indoor shoes, sportswear, an umbrella, cloths for cleaning, and a disaster prevention hood. We only get textbooks for free. In addition, we have to write our name on everything, even each of the pencils. We keep writing our name on our belongings at elementary school, and we learn to take good care of things based on the idea of “gods exist in all things,” which is a saying of many gods. Japan is an academic background-oriented society. Japan’s education is compulsory until age 14. Probably anime characters studied hard at junior high school because they have to pass the entrance exam for high school. 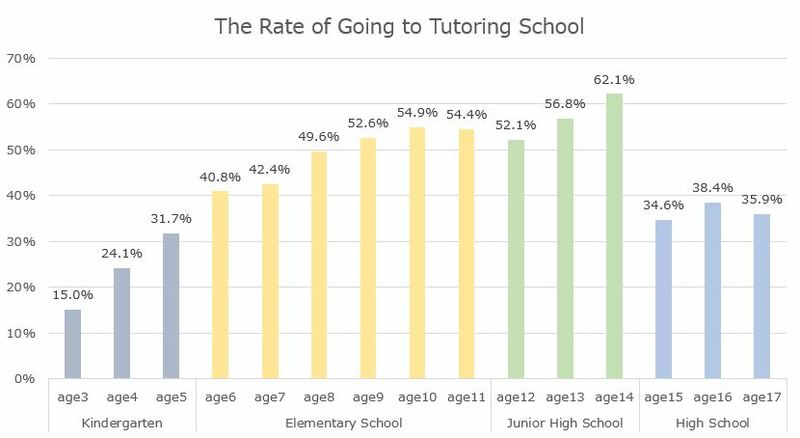 Therefore, most of us go to tutoring school since we’re young as the following image from “The Rate of Going Tutoring School” shows. However, we can’t take exams of all of the high schools which we want to go to. We can choose some public high schools depending on the district which we live in. When it comes to private schools, we can take exams for any schools which we want to go to as long as we can pay the high tuition. It’s very important to go to an advanced high school because it’s the best way to pass the entrance exam for advanced universities. Once we graduate from the university, we can get a job at a good company and make a lot of money. In other words, our salary depends on the university which we graduate from. 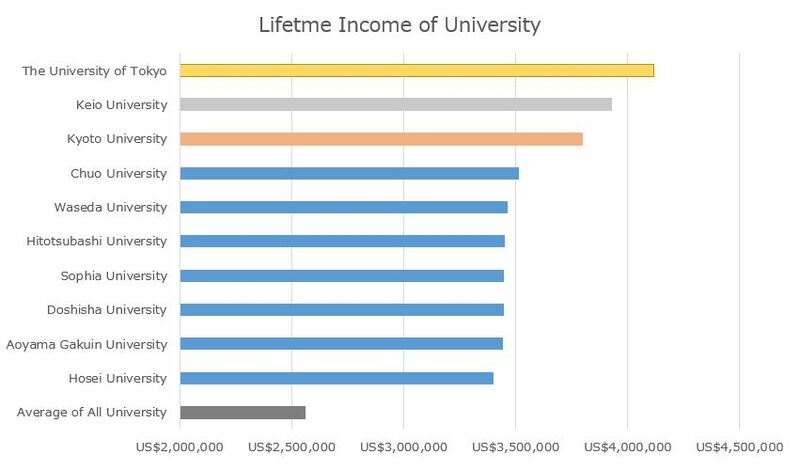 In this image from “Lifetime Income,” you’ll see that the graduates from Tokyo University earn much more than the average. Waseda University and Keio University are also advanced private universities in Japan by the way. The Japanese employment system is unique, and all Japanese new graduates start job-hunting at the same time. We can apply to companies which we’re interested in regardless of our major. Once we get employed, we keep working at the same company until our retirement. Therefore, we have a seniority system that salary and promotion are based on. Our system is changing to a merit system now, but still the seniority system is strongly rooted in Japanese society. Japanese schools don’t have school buses. We go to school on foot, by bike or bus. Teachers regularly guide students not only at school but out of school. Teachers help us learn traffic rules for 9 years during our commute. Because of this, Japanese pedestrians are famous for having good manners. Some high school students ride a scooter. The minimum age for driving a car is 18 years old, but we can get a scooter license above 16 years old. 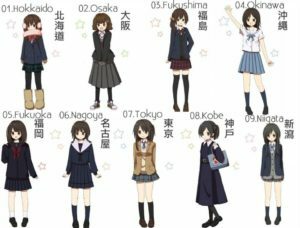 Most Japanese junior high schools and high schools have school uniforms. We classify them into two types: sailor-style school uniforms and blazers. Boy students don’t usually wear sailor-style, and they wear “Gakuran” (学ラン, がくらん), which is a Japanese school uniform for boys. We keep wearing the same uniforms for three years. We, especially girls, decide which school we want to go to based on which uniform we like. In general, Japanese school rules are strict. The hairstyles or the skirt length in anime are usually against the rules. 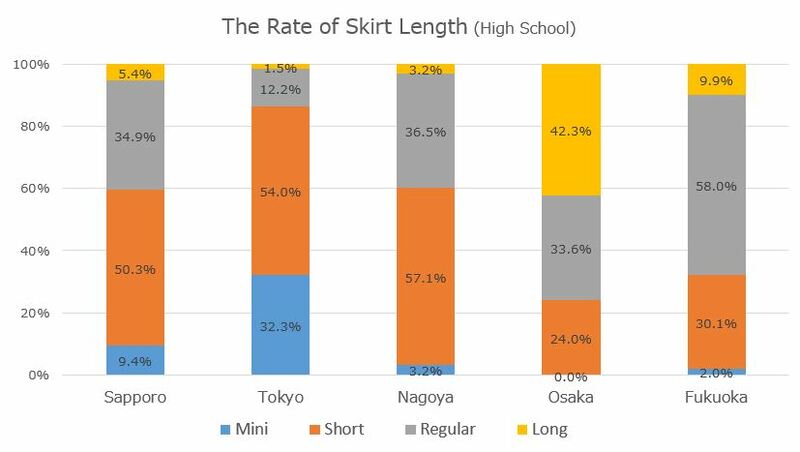 However, like the following image from “The Rate of Skirt Length,” the skirt length in real life isn’t so short. Mini is over 6 inches above the knees, short is above the knees, regular is on the knees and long is below the knees. Almost half of the girl students are regular or long. School uniforms are important not only for students but for their parents. I’ll tell a story from the Japanese news about school uniforms. A public elementary school in Tokyo needed new school uniforms, and they reached out to Armani for help. The full uniform set would be JPY 80,000. Some of the parents complain about the price. The school doesn’t force them to buy the uniforms, but they have no choice but to buy them because they don’t want their children to be different from other students. Also, most Japanese have black hair, so some teachers ask students who have naturally brown hair to dye their hair black. Actually, my teacher at high school asked my friend to dye her hair 10 years ago. She convinced him that her hair was naturally brown so she didn’t have to though. This happens sometimes in Japan and appeared in the news recently as well. Japanese schools want all students look the same. These became topics of conversation in Japan, but this kind of news is very rare. Japanese school rules are stricter than those in anime. School hours differ by the grade. Elementary schools are four to six hours, junior high schools are six hours and high schools are six to eight hours. We learn “Kanji” (漢字, かんじ) at school for 12 years which foreign people studying Japanese have a hard time with. We learn Japanese, math, science, social studies, English, physical education (PE), home economics, music and art at elementary school and junior high school. In addition, we learn Japanese classic literature, Chinese classic literature, chemistry, biology, geography, Japanese history and world history at high school. We choose a science course or a humanities course at the second grade of high school, or eleventh grade. We rarely fail to pass on to the next grade even though we get bad grades. In junior high school, we need to do well on entrance exams and personal evaluations. We need to have a positive attitude in class to do well in our personal evaluations. High schools decide whether to accept or reject examinees based on the scores on entrance exams and their evaluations. On the other hand, only test scores are important for entering college. Therefore, to put it in an extreme way, all we have to do at high school is to study only for the entrance exams. We eat school lunch at elementary school and some junior high schools, and bring a “Bento” (弁当, べんとう) to high school. Most private high schools have a school cafeteria, but public high schools rarely do. We usually eat lunch in our homeroom. You may have seen some anime characters eat a “Bento” on the rooftop, but it’s usually closed there for safety in real life. However, we have a school store, and compete to buy food at lunch like anime. We’re lucky if our homeroom is near there because we have a big advantage. We have 10 to 15 minutes break between classes. Most of us have a chat with friends, but there are two things you wouldn’t see in anime. First, some students eat lunch during a break. We call it “Hayaben” (早弁, はやべん). Most of them are members of an athletic club and get some food for lunch at the school store. Next, some do their homework even during a break. Especially at high schools, studying before classes are very important to keep up. We regard study as more important in real life than in anime. Many Japanese people join a club at school. 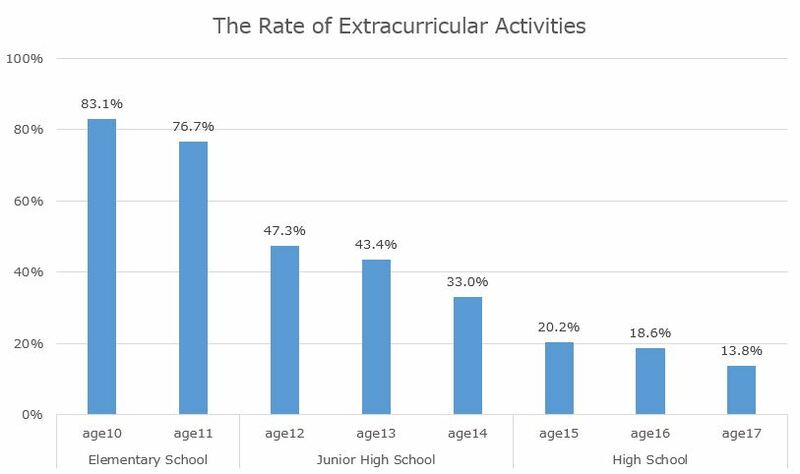 As the following image from “The Rate of Extracurricular Activities,” most of us do some after school activities like piano or swimming when we’re at elementary school. However, we devote ourselves to club activities at junior high school and high school. We call them “Bukatsu” (部活, ぶかつ). There are many kinds of them at school: soccer, baseball, basketball, volleyball, tennis, “kendo” (剣道, けんどう), “judo” (柔道, じゅうどう), “kyudo” (弓道, きゅうどう), which is the Japanese archery, art, photography, tea ceremony, “manga” (漫画, まんが), and so on. There are lots of Japanese anime about club activities and some of us decide the club because of the anime we like. 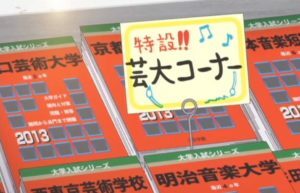 In reality, many students all over Japan joined a “light music” club in 2009 when “K-On!” was first aired. Students who don’t join a club are in “Kitaku-bu” (帰宅部, きたくぶ), which means “Going-home club” in Japanese. And then, we call students who are casual members “Yurei-buin” (幽霊部員, ゆうれいぶいん), which means “Ghost members” in Japanese. We learn a relationship between our elders and our juniors through the club activities. 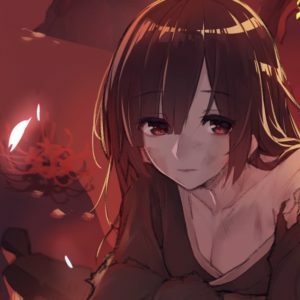 We call our elders at school “Senpai” (先輩, せんぱい), and call our juniors “Kohai” (後輩, こうはい). The concept of “Senpai” and “Kohai” is very important in Japanese society. We have the relationship not only at school but at work. “Senpai” teach us how to work, and then, when we have “Kohai,” we support them as “Senpai.” Like this, we regard age as important. We always pay attention to the age of person we talk with and use honorifics called “Keigo” (敬語, けいご) in Japanese. That’s why we have a seniority system because age is more important than ability. Also, we have some school events. We hold ceremonies on the first day and the last day of each term as well as an entrance ceremony and a graduation ceremony. They’re just a matter of form for students, but schools regard these events as important because Japanese people think process is more important than results. In addition, most of us retire from the club in the spring at the third grade of high school. Then, we go on a school trip and hold a school festival before the summer at the third grade of high school. This is because we start studying for the entrance exam in earnest after summer. 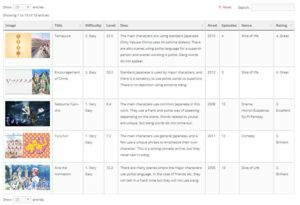 Japanese schools have some unique characteristics compared to foreign countries. First, students are allowed to enter a teachers’ room. We go there when we want to ask teachers some questions, or when teachers ask us to come. Most of us don’t want to go there though. Students don’t always have to move around to take lessons. We usually stay in our homeroom and wait for teachers there. We have to move around only when we take a PE lesson, music, arts and so on. We take turns being on day duty, that is note-taking and cleaning off a chalkboard. Also, the student on duty says, “Rise, bow, take a seat.” when we greet a teacher before class. Each class has a daily cleaning assignment. We clean our homeroom, the school entrance way and hall, and washrooms. We don’t use vacuum cleaners. Instead, we use brooms, dust pans, and cloths. We also empty trash cans by ourselves. Cleaning is, for Japanese schools, a form of education. We learn how to keep the public space clean through cleaning at school. We’re busy during summer vacation. We go to school for club activities in the first and second grade of high school, and then spend most of our time studying for the entrance exam in the third grade of high school. Each school has a parent-teacher association (PTA). They support school for children as a volunteer, but they’re usually chosen by random draw. Japanese school systems have a big issue of English. We learn it for six years minimum at school, but the lessons focus mainly on writing and reading. Most of us can’t communicate verbally in English. As I mentioned before, Japan is an academic background-oriented society, and our salary depends on the university which we graduate from. That’s why Japanese students in real life study hard. Plus, the entrance exams vary by universities. Therefore, we have to study for each university which we want to go to. 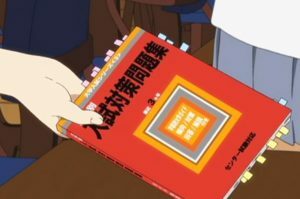 For example: we get textbooks called “Akahon” (赤本, あかほん), which means “red book” in Japanese. The covers are red. Each book has past problems of each university’s test. We get some and solve the problems a lot until the entrance exams. We can get them at any bookstore. In addition, some students also go to cram school. The cram schools have some courses for each university and we can choose one of them. Also, some students who didn’t pass the exam for their first-choice university go to cram school one more year, and study for the next chance. We call them “Ronin” (浪人, ろうにん). It’s worth the effort in a Japanese society. However, once we get into college, most of us don’t study hard anymore. We spend our time hanging around with friends or working part time. Some call Japanese college days “the summer vacation in our life.” Plus, it’s not so difficult to graduate from Japanese college. Who wants to study? Cherry blossoms have a close connection not only with spring but with our life in Japan. For example: “the cherry blossoms bloomed.” means “I passed the exam.” in Japanese. 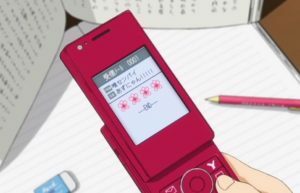 This image from “K-On! !” is the scene where Yui (唯センパイ) tells Azusa (あずにゃん) that she has passed the exam by “cherry blossoms mark”. And also, “the cherry blossoms fell.” means “I failed the exam.” in Japanese. We get into school in spring, retire from club in spring, take entrance exams in spring, and graduate from school in spring. All of the turning points in school life happen in spring. Japanese people like cherry blossoms because each of us has memories associated with them. You would see cherry blossoms a lot in Japanese anime because they have a close connection with our school life, and they remind us of our memories. The Japanese employment system is unique. Japanese new graduates start job-hunting at the same time. Most big companies regard the university which students graduated from as important. Therefore, students from advanced universities have a big advantage over the others. Lifetime employment is also a distinctive characteristic of our labor system. Once we get employed, we keep working at the same company until our retirement. The company rarely fires us unless we make a serious mistake, so we rarely change jobs but instead get a regular pay raise. The longer we stay at the same company, the higher we get paid. Therefore, we have a seniority system at work like the relationship between our elders and our juniors at school. In a sense, our salary depends on the university which we graduate from. However, it’s not important to study hard at college. Even our major is not so important because most Japanese companies want to get not specialists but generalists. In short, our salary depends on how much we study at high school and which university we pass the entrance exam for. Anime characters seem to enjoy their school life a lot, but possibly they study hard behind your back. Most of the school life in anime are the same as that in real life, but we study harder at school. This is because Japan is an academic background-oriented society, and our salary has a close connection with the university which we graduate from. Our society is changing, but still many people believe that. Therefore, students in real life study much harder. 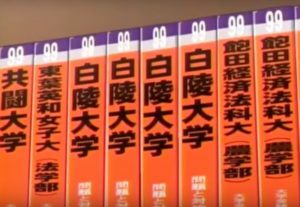 If you study Japanese as hard as us, you should pass the exam for JLPT or be able to watch the “Monogatari (series)” in Japanese.